Grow one of the oldest American cultivated plants and join the Incas and Aztecs who grew – and revered – sunflowers more than 4,600 years ago. While there wasn’t much variety in the sunflowers for ancient civilizations to grow, there certainly is now. ‘Russian Giant’ quickly grows to 12′ tall with a huge medium brown “face” surrounded by bright yellow petals. 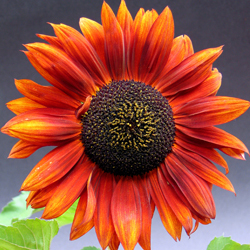 On the other hand, ‘Choco Sun’ looks similar but only grows to 15″ tall and with a 5″ face. Don’t think all sunflowers are vertically growing brown and yellow either. ‘Cherry Rose’ has the familiar brown face, however deep red petals with tips of bright yellow-gold surround it. ‘Pastiche’ glows in reds, oranges and buffs. ‘Black Magic’ is completely dark. And ‘Inca Gold’ trails downward! 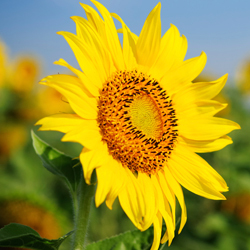 Kids love planting and watching their sunflower grow, grow and grow, and there are plenty of fun science projects kids can experiment with sunflower seeds. Later, eating the seeds is a healthy snack. The folks in Kansas chose the sunflower as their state flower. As an American native plant, its diverse uses make it one of the economic forces in the agricultural world. As a crop, its seeds are in human and bird snacks, the oil is used for cooking and the remaining pulp is a popular livestock feed. 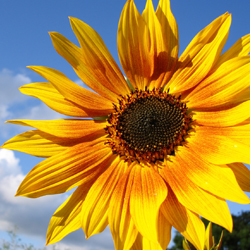 Sunflowers also make gorgeous cut flowers in summer and fall. Many sunflower varieties are available as seeds. Also, many garden centers often offer a selection of well-rooted seedlings or small plants. Tall or short, yellow or red, upright or trailing, the growing requirements are the same. Start seeds indoors six weeks before the last frost date or sow seeds directly into the garden after all danger of frost has passed. Cover seed with 1/2″ of soil. Improve growth and bloom by working compost into the outdoor bed or pot. If you are growing giant sunflowers, provide a support such as a trellis or stake. Otherwise, they may fall over as they grow when the large heads get heavy with seeds. Chose an outdoor location in full sun. As these plants develop, the flower heads will “track” the sun daily. However, contrary to popular myth, after the face develops, it stops and puts energy into seed production. To see the plant’s face, choose a location where you will see the flower facing eastwardly. At least six hours of sunlight produces beautiful flowers and abundant seeds. Provide regular water or plant seeds in a naturally moist location. They bloom from midsummer into autumn. Birds love sunflower seeds. Therefore, cover the heads with netting if you plan to harvest. When harvesting, cut 12″ of stem with the head, hang it upside down and allow the head to dry. The seeds will loosen and be easy to rub off once dry. Alternatively, you may leave the flower on the plant to provide bird food through the fall and winter, or give the whole cut head to hungry birds. They’ll thank you for it. Just be sure to save a few seeds for next year’s sunflower garden!